Up to 25 jobs are under threat at Europe's biggest granite quarry in Argyll, according to union leaders. 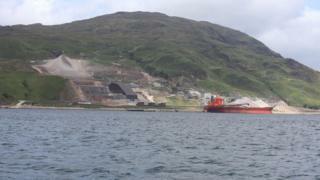 The GMB claim half of the staff working at the Glensanda Quarry, north of Oban, face the sack from a new contractor. The union fears Spanish-owned Oban Earth Works will cut 50% of staff when it takes over excavation and haulage operations at the quarry. That work had been carried out by the Hargreaves company on behalf of Aggregate Industries. A spokeswoman for Hargreaves said their contract ended in May, but they would remain during a handover period until the end of July. They say staff have been transferred across to the new company. A spokesman for Aggregate Industries said: "As with any commercial operation, it's important for Aggregate Industries to review and renew our partnerships, to ensure we can offer the best service available. "We are switching load and haul provider at our plant in Glensanda, and as part of that process there are individuals who will be transferred from our current provider Hargreaves, to our new one (FERPI). Unfortunately, due to increasing production efficiencies on site, there are some employees at risk of being made redundant by FERPI. "We understand and appreciate that this is a potentially difficult time for those individuals affected and have been in close contact with FERPI to ensure employees are offered all the support they need throughout the consultation process." The BBC has been unable to speak to anyone from Oban Earth or Aggregate Industries.